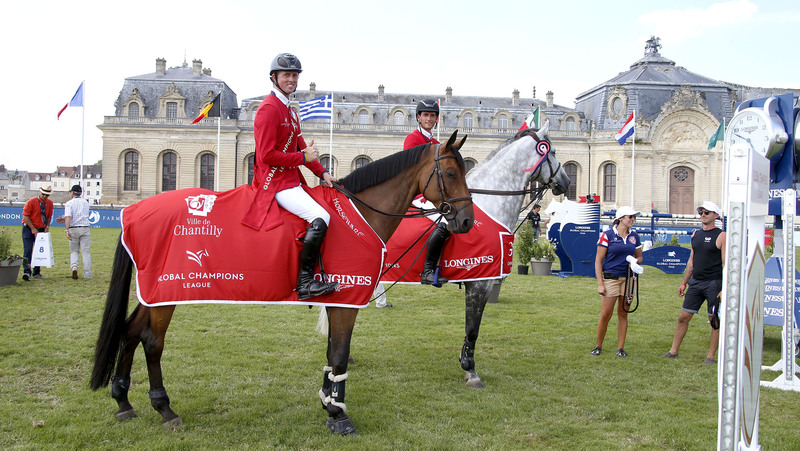 London Knights have secured a sensational third win of the season, after a knife-edge finish saw Ben Maher with Explosion W and Nicola Philippaerts with H&M Chilli Willi take the top step of the podium at GCL Chantilly. It all came down to the final furlong at the stunning venue, surrounded by Chantilly's famous racetrack by its fairytale Chateau. The gallant Knights finished just ahead of Valkenswaard United’s Marcus Ehning and Alberto Zorzi - both on four faults apiece, but the Knights ahead on time. With both teams scoring maximum points today, it’s shaping up to be a thrilling joust to the finish as the two teams pull away from the rest of the field. With one eye on the final in Doha and the GCL Super Cup at the GC Prague Playoffs, Knights rider, Ben Maher spoke of the team’s focus and commitment for the rest of the season: “We're very happy with today’s result but for sure we’ll want to keep going the whole way to Doha." Shanghai Swans’ duo of Daniel Deusser and Shane Sweetnam took third, rising from 11th at the start of today’s competition, the high drama round proving that every fence counts as teams fight for supremacy in the overall rankings. Today’s result means the Knights have extended their lead to 244 points with United on 227. Miami Celtics have dropped behind the leading two, now on 169 overall, while the Scandinavian Vikings cling on to fourth in 167, just two points away from Montreal Diamonds in fifth on 165. Fans flocked to the arena flanked by the Chateau de Chantilly’s Grande Écuries, packing the grandstands for the 11th leg of the Championship race. Guests from around the world enjoyed French cuisine and relaxed in the elegant Lounges by Hermès and Möet & Chandon as the 19 GCL teams took centre stage. Despite the galloping expansive arena, Uliano Vezzani put together a delicate and careful course this afternoon which couldn’t be rushed, with fences set at a maximum 1.55/1.60m. Featuring a Renault oxer, a Longines plank, a spooky looking wall and a wide oxer over a water tray to finish. But the biggest challenge of the course came after a wide triple bar saw riders take a curving turn to the GC double of verticals, with a short eight strides meaning the first part fell time and time again. For those who came on the forward seven strides the second part would fall, so absolute precision and balance would be the order of the day to jump this course clear. There was disappointment for Shanghai Swans - Shane Sweetnam with Main Road pulled out a clear, but another four faults from Daniel Deusser and Tobago Z put the team on a score of 8. A speedy time however would keep them in touch, with the pressure on the rest of the teams. Similarly a pole for Jos Verlooy and top stallion Caracas of Montreal Diamonds, and an unusual fault after a look at the wall from teammate Harrie Smolders and Emerald meant the team would drop down to 12 faults overall. There would be thrills and spills throughout the course - the Berlin Eagles were eliminated after Kamal Abdullah Bahamdan with Asathir refused the wall. There was further drama after teammate Christian Kukuk also jumped the wing of the wall with Limonchello NT, outside the flag - but his score would not matter with the team plummeting to the bottom of the order. As the teams continued, the tough track took its toll. Seven faults from St Tropez Pirates' Athina Onassis with MHS Going Global, and a further 8 from Pieter Devos with Apart meant the team would be out of contention. The pressure was on the three remaining teams - all entering today on a zero score. An unusual eight faults for Jessica Springsteen and RMF Zecilie of Miami Celtics meant teammate Denis Lynch had everything to do with RMF Echo to try keep the team on the podium. But their time was slower and they slipped behind the Shanghai Swans in the order. Alberto Zorzi of Valkenswaard United took centre stage with Contanga, looking to repeat their strong performance from yesterday where the duo finished on a clear. Another faultless round from the Italian star put Marcus Ehning in the best possible place, as he took over the reins - this time with a strategic horse swap with Cornado NRW. But a pole fell, putting the team on four and momentarily handing the advantage to their big rivals, the London Knights who were the final team to go. Nicola Philippaerts and H&M Chilli Willi were the first of the scarlet jacketed London Knights to take on the course, but the drama would come right down to the wire after a pole fell for the pair, putting them on a score of four. With enormous pressure on his shoulders, Ben Maher cantered through the start-gates with the 9 year old Explosion W, knowing only a fast clear would secure the win. The packed grandstands watched with baited breath as the pair flew around the arena, the galloping course suiting the chestnut gelding and Maher pulling out all the stops to set up the enthusiastic horse perfectly to the fences. Their focus paid off, with Maher finishing clear, and crucially faster than United’s combined time to take the team’s third win of the season. The circuit now looks to Berlin, where the race to qualify in the top 16 for the GCL Super Cup at the GC Playoffs rockets up a gear. Jan Tops, Co-Founder GCL: "This is an amazing venue - in this big arena, after small arenas, you see different classes and different horses and that is the beauty of our circuit. Nicola again did amazing and the London Knights have a real chance to win the title this season. These teams are very strong - they reserve their horses for the circuit every time, and they are really rewarded. [London Knights] and [Valkenswaard United] are at the moment the teams [to beat] but we have five more events and anything can happen. But the Knights are very strong - Ben is really consistent with both of his horses, he makes a really good program and in the future most of the teams will do it like that." Daniel Dessuer, Shanghai Swans, 3rd place: "After the first round we had a lot of teams with four points - we were 11th to start today and finished 3rd so it shows how close everything is and how many possibilities you have. Shane is a very experienced rider, with a good horse and a good team behind him, so I hope I can ride more time with him!" Alberto Zorzi, Valkenswaard United, 2nd place: “I am so happy for my double clear, and happy with my horse. Marcus had one down but he’s one of the best riders in the world. It’s hard, but we will keep fighting [to rival London Knights]." Ben Maher, London Knights, 1st place: “We have a very strong team with good riders, good horses and each rider has a couple of horses to swap and change we try to select right horses for right shows and so far plan is going well! Valkenswaard United are always there but we're very happy with today’s result but for sure we’ll want to keep going whole way to Doha. The next group of shows are important for us. Explosion is only 9 years old so was under a bit of pressure today to produce the clear. But in the end we have a very good team and each of us make our lives easier by staying consistent." Nicola Philippaerts, London Knights, 1st place: "My thoughts was try to go quick enough and try to stay clear. I had a mistake at the double, which was quite expensive but Ben made up for it and made the win today. For the moment [the team camaraderie] is amazing - the five riders are very nice riders, we get along well and have a good team spirit as well as a few good combinations."